So, if you will permit me a week off from preaching God’s Word, I’d like to share with you about our church—where we’ve been and where we’re going. I want to spend a Sunday doing this because we’re a church family, and I want you to be as exciting about what God’s doing here at RiverLife as I am. Now, if this is your first time here… First-off you’re awesome; thank you for joining us today. Second, this will not be a normal message today. Please come back again for a regular service. Praise to God for all of that! So, do you want to see some details? Let’s talk about attendance. Here is a graph of our monthly average attendance over the last 4 years. I know it looks like we screwed up our launch and everyone left. But that’s not what happened. This sudden drop was exactly what we expected. We followed a “Launch Big” model and it creates this type of scenario. It’s okay, as long as it leads to the next phase. The growth from the previous section just continued. We were finally starting to figure out how to do church. We were getting our routines and systems down. We were adding ministries. And God just kept bringing people to RiverLife. So, we grew consistently for three years. Then an interested thing happened this year in 2018—we started to level off. For this whole year, we’ve been ranging between 230-250 people on a Sunday. We have some theories as to why, and I’ll share those later. Let’s talk about finances. This is the one that I’m most excited to tell you about because RiverLife experienced a God-miracle last year, and it was because of God working through YOU. But first, the big picture. 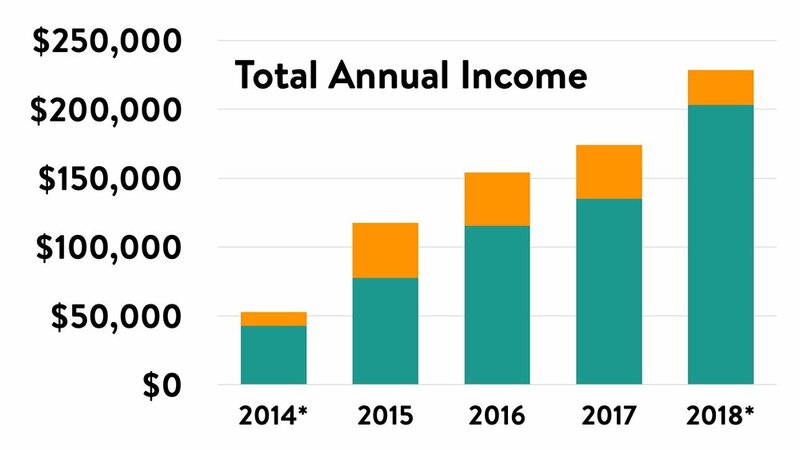 Here’s a chart of the total annual income over the last 4 years, and as you can see, it’s looking pretty good. Every year you have been giving more and more to RiverLife.That’s a sign of a healthy church and a healthy congregation. Thank you. Yes, our attendance has grown, but what’s so cool is that our giving has grown at a higher rate than our attendance. And that’s a good sign. We are now 90% self-supporting. In 2015 (our first full year), district support represented 34% of our total revenue. In 2016, it was 25%. Then 22%, and this year, it’s representing only 10%. That is wonderful. You can see that it goes up and down each month. That’s normal. It’s generally been increasing over time. But there’s one thing that I want to highlight for you. This is the God-miracle that I mentioned earlier. Look right here That was December 2017. Before that point, through 2016 and 2017, we gave an average of $10,000 a month. After that point, you gave an average of $17,000 a month. Within one month, our giving increased 70%. That is AMAZING. Thank you for your obedience to God and your love for RiverLife. Prior to that point, the church was living month-to-month. We usually had about $5,000 in the bank. That might sound like a lot, but it wouldn’t even pay half of one month’s expenses. Now, we have $30,000in the bank. That’s nearly month’s expenses. That’s because you give to RiverLife. This summer we made two staffing improvements. We hired Pastor Kong as a part-time Associate Pastor. We never could have done that a year ago. I personally want to say thank you because I was getting really tired as a solo pastor. And having Kong on board and literally breathed life back into me. We gave all the hourly staff a $2/hour raise. So, they’re now at $14/hour. Not where I’d like them yet, but we’re getting closer. We were able to do that because you give to RiverLife. So, after financially struggling for three years, we are now in a great place. Thank you. Overall, there’s going very strong. Each year our Community Engagement has added ministries. Now, every month, we serve the homeless, refugees, the hungry, our Twin Cities communities, and our neighbors. We have a great website that gets about over 6,000 unique visitors a month. And our web traffic has nearly tripled since the beginning of the year. We have an active Facebook page with around 400 Page Views a month and over 3,000 engagements with our content a month. We have an app that’s okay, but it needs a little work. And, to be honest, we don’t have metrics on its usage. We’ve been having problems with the vendor. Our Connections Ministry, which is our Greeters, Café, and Info Table do a great job creating a warm, welcoming experience every week. RiverKids—that’s the new name of our Children’s Ministry—is going awesome! They’re averaging 70 kids down there every week. And they have an incredible team of nearly 50 that care for and spiritually nurture your kids. Thrive Youth Ministries – Tommy & Kong are averaging 30-40 youth every week and continue to grow. And lastly Life Groups.This is the one ministry of the church that isn’t quite thriving like it used to. Here’s a chart of the average weekly attendance for our Life Groups. For our first couple years, 30-35 people attended a Life Group each week. Now, this year, that number has dropped to about 15 people a week. Unfortunately, that chart doesn’t quite capture the full picture. Here’s a different chart. This one represents the Life Group attendance as a percentage of total church attendanWhen we launched, we had about one-third of the church participating in Life Groups. Now, that number is 6%. In summary, most of our ministries are healthy and striving. We have one that isn’t and needs a little attention. Lastly, let’s talk about the leadership of the church. I’ll repeat what I often say: This is the best team I’ve ever worked with in my 15 years of ministry. I love them, I trust them, and they are really good at what they do. So, we have the equivalent of 2.5 full-time employees, but it’s split across 6 people. Have you ever wondered how this team came about? Were they chosen, elected, randomly picked off the street? I’ll explain it in 2 phases: The first phase was early on when we launched. The second phase was ongoing, over the last 3 years. When my wife and I were planning RiverLife, we made a decision that we wouldn’t recruit people. We trusted God and believed he would bring the right people to us. So, we let people approach us. That’s what happened with Johan (and his wife Pajjar) as well as with Alicia and Meejoluj. We also believe in the principle that we launch ministries when God raises up a leader. We never force a person into the ministry because we believe we should have it. That’s why when we launched, we didn’t have a youth ministry, and why we still don’t have a missions ministry. God hasn’t raised up a leader for it (yet). But that might be changing in 2019. Once we had some years under our belt, that process changed. Now, for the most part, God has raised up leaders from within our own ministries. Ying started working in the Café, then led the Café, and now he leads the whole Connections ministry. Even Pastor Kong started out as Assistant Youth Director and now he’s our Associate Pastor. So, when we look for leaders, we look for people who are already faithfully serving, who love the church and the people, and have demonstrated success in their roles. In summary, our team is amazing, and they are a big part of why RiverLife is a healthy, growing church plant. So, there you have it. A generally very positive summary of the health and growth of RiverLife. Now, let’s shift. Let’s talk about the future. You’ve heard where we’ve been. Now it’s time to talk about where we’re going. This exciting. This is the future of RiverLife. In my office, I have this sign that says, “Ride the Wave.” It’s a throwback to my SoCal beach days. But it’s more about paying attention to what God’s doing around you. Look for the waves that he’s making and ride them. That’s what looking into the future is about: seeing what God’s doing and working with him in it. That’s why I want to keep growing. But, at the same time, I don’t want to have a 1,000-person church in one building. I want our congregations to stay small. That’s why we talk about launching a second campus over in Minneapolis. In five years, I would rather see three RiverLife campuses of 300 each than a single 1,000-person church. I shared earlier about we experienced 3 years of steady growth, and then this year we’ve plateaued around 230-250. If we extrapolate this graph out 5 years, here’s what it looks like. This shows two possible trajectories: (1) if we continue the growth of 2018 and (2) if we return to the growth of the prior 3 years. In 5 years, one path would put us at a 500-person church and one a 300-person church. I can tell you which one I want. I’m optimistic that some of the changes we’ll be making in 2019 will help us continue our growth. Be financially self-supporting within 1 year. We’re at 90% already; we’re close. To “level up” to an accredited church, we have to be self-supporting. We have 2 more years of funding, but I want to finish in one year. That way, we can bless another new church plant with $25,000. See a 30-40% increase in annual giving for the next 3 years. This happens because of your obedience to God and love for RiverLife. 100 new givers in 2019. This year, we’ve had 86 first-time givers. I want to see that increase to 100. That means that more people are taking that big next step. 60% of our digital giving from recurring gifts. Right now, about 45% of giving from the app and website is recurring. I want to see that increase. It’s one of the best ways to stabilize the monthly finances of the church. What do you think? Is this something you can get behind? Now, let’s talk about ministries. This is really the heart of the church. I want to start with the big-picture and then tell you about some exciting things planned for 2019. In preparation for this message, I went back and read our original strategic plan for RiverLife. I wrote it 5 years before, when this church was just an idea. And what’s awesome is that we have accomplished nearly all of the original strategic plan. We’ve successfully created a church that has brought hope and healing to second and third gen Hmong. Now, we need a new strategic plan for the next 5 years, and this one is going to focus on helping people grow and mature in their faith, what the Bible calls discipleship. Relaunch Life Groups. We’re going to regroup, pour into our leaders (current and new ones), and ensure that our Life Groups are one of the best spiritual growth experiences you can have. Add Sunday school, called Growth Classes. These will be every week. Each month will cover a new topic. They’ll be taught by Pang Foua, me, Pastor Kong, and others. And, yes, childcare will be provided. Host monthly social events. This is what the Bible calls fellowship. We acknowledge that there haven’t been a whole lot of opportunities outside of Sunday for you get to know people and build friendships here at church. We’re going to fix that. Introduce membership. I preached about that last week (listen online) and will take the whole month of January to talk more about it. This is part of the larger initiative of becoming an accredited church. And that’s just the beginning. We’re also looking at missions and possibly restructuring our Community Engagement to focus on local and global outreach. And then we’re starting to think through what’s called a leadership pipeline, a place for you to learn more about serving in the church and how God has shaped for that. So, it’s an exciting time for RiverLife right now. Lastly, let’s talk about the leadership of the church. I want to tell you about two of my goals for the coming years. First, as we grow, we’ll need more PAID STAFF. Otherwise, two things could happen. Our current leaders will get burnt out. It just becomes too much work. I don’t want that to happen. I never want ministry to fry out a person. That’s just wrong. It will limit our growth. Guests visit but not come back. You might be frustrated because we’re dropping the ball on things or our quality of ministry suffers. Children’s Director – We currently average 70 kids on Sunday. Pang and GaoZoua share 20 hrs/week. That means we are grossly understaffed. Youth Director – Right now, they average 30 youth on Sunday. At the end of this school year, when we level up, they will receive ten new 6thgraders. Our youth group is going to grow 30% overnight. This role really should be half-time by next summer. Associate Pastor – Right now Pastor Kong is at 20 hours. I would like to see this role go full-time eventually. I’m just not sure when yet. Community Engagement Director – Alicia is doing an AMAZING job with a big ministry, and it’s all volunteer. For us to continue to make an impact locally and globally, I’d like to see this go to a quarter-time position. It’s really just to honor Alicia for the work she’s already doing. So, there are four of my staffing goals. Do you remember those financial goals I mentioned earlier? The reason we have those is so that we can do these. There’s one other big change to our leadership that will be coming in 2019. As part of our process of becoming an accredited church, a “grown up”, we will be establishing a Governing Board here at RiverLife. They will oversee the spiritual direction of the church and be the ones that I report to. The Alliance offers two possible structures for a Board. The first is called an Elder Board, consisting entirely of elders, which by biblical definitions are men. The second is called a Majority-Elder Board, which consists of male elders and female leaders. Because RiverLife highly values the voice and contributions of women in the church, we’ll be going with a majority-elder board. That’s really all I’ve decided so far. This will likely come into play in the Fall and Winter of next year, so you won’t hear much about it for a while. But I want to give you this reassurance: we will have a healthy, well-functioning board. If you have had bad experiences with church boards, I’m sorry. That’s not how God intended churches to be led. And rest assured, I will work hard to create a Board that is as awesome as our Ministry Team. There you have it—the state of the church, where we’ve been and where we’re going. Thank you for loving RiverLife. Thank you for giving. Thank you for serving. You are part of the reason why RiverLife is as healthy of a church as it is. As I mentioned, I’m going to post all of this online in the next couple days, so you can review it. Come up and chat if you have questions or ideas. I welcome your input.